King Francois I was attracted to two very different personalities when he ushered in the French Renaissance in the early 16th century. The Italian painter Raphael was the paragon of taste and restraint. His proportioned works set standards for classical balance that no one has ever bettered. But the other painter was a rebel. Rosso Fiorentino reacted against Renaissance ideals of measure by painting the opposites: bright colors and intense emotions. Some people thought he was perverse, but he helped establish mannerism as an artistic style. 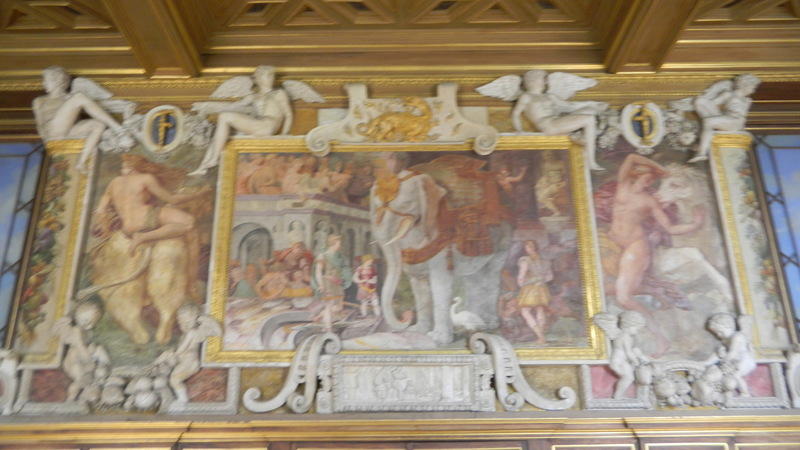 Francois brought every Raphael picture he could grab to France, and he made Rosso his principal painter and put him in charge of decorating the palace at Fontainebleau. Magic was bound to happen. 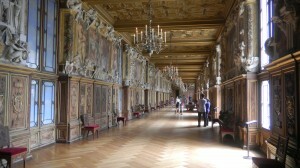 Francois built Fontainebleau’s long gallery (above) and commissioned Rosso to fill it with paintings. He had other artists add statues and plasterwork. The paintings are challenging–they’re crammed with symbolic meanings that historians still haven’t figured out. Francois kept scholars around, including one of northern Europe’s most renowned humanists, Guillaume Bude. The dense canvases evoke over-busy male brains–guys discussing big and useless ideas long into the night over generous amounts of alcohol. But France was just learning about the world beyond its medieval past, so you can understand the enthusiasm that went with the discovery of the Italian Renaissance and ancient art. The Royal Elephant which Rosso painted (above) suited those imaginations, Francois’ desire to project his own image, and Rosso’s itch to flout conventions at the same time. The painting is an allegory of Francois’ good rule. He’s the elephant–since Antiquity this noble animal had symbolized royalty and wisdom. The stork behind his left front leg stands for filial piety. Saturn’s 3 sons stand around the elephant, and they represent elements: Fire (Jupiter), Water (Neptune) and Earth (Pluto). 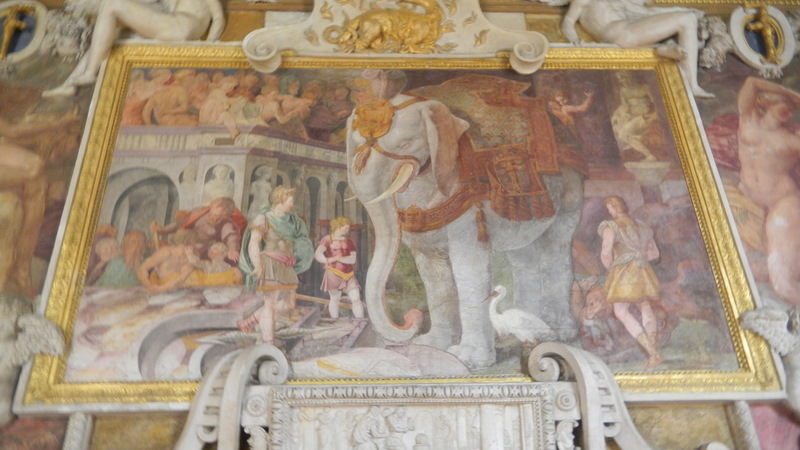 The revelers on the left side of the painting might symbolize bestial passions, which the wise elephant overcomes. Not even my big idea-loving brain wishes to get into the rest of the allegorical stuff around the elephant. But Francois was doing the same thing that the Elector of Heidelberg did at Heidelberg Castle. Both used figures from the classical and Christian worlds to project themselves as the world’s best rulers. This was common in 16th century Europe–cities, literacy, commerce and court bureaucracies grew. And people’s horizons were expanding into the classical world of Greek myths. So Francois was using every symbol he could to bolster his image in an increasingly complex world. His method contrasts with the Elector of Heidelberg’s simple linear order. Francois’ style may seem bombastic today, but modern scholars have proposed deeper meanings in the art. And the opuses in the long gallery greatly inspired French culture and much of the rest of the West. In the final post on Fontainebleau, we’ll see that those bloated male egos really did make magic. You can also explore another cultur’s magic in a recent post on Thailand’s art. The temple it examines was built when Fontainebleau was, so both make a cool inter-cultural comparison. Feel free to comment if you’ve had any adventures in the 16th century, or if you want to share useless male pondering.